The Chief Rabbinate has ceased testing or at least publicizing findings from tests conducted on the so-called gush katif greens. I will say the from buying different products from time-to-time I have noticed many of the so-called insect free brands with different hashgachos are not fit to be eaten without cleaning. The Kosharot organization has conducted its own independent tests. I can only speak for myself but I for one have learned their tests are quite rigid and I find their list of recommended brands useful for they are expert in testing, know what to look for and well aware of how the greens must be washed. Kosharot reports testing 19 of the so-called ‘gush katif’ brands, inspecting lettuce, celery, beet leaves, parsley, mint leaves, scallions and more. The tests show that all of the brands have insect infestation to some degree. JKN adds that some tests conducted by others in the past will only check lettuce and then recommend a company, while Kosharot is always careful to inspect numerous products under the same brand label before making any recommendations. The tests also included determining trace levels of pesticides on the end product. The brands recommended below are in compliance with the Chief Rabbinate’s guidelines. Kosharot strongly recommends that even these brands, the best among the 19 tested, should be soaked in a soapy solution and rinsed before eating. Regarding the other brands tested, multiple soaks and washes are required before eating. Posted on May 20, 2014 by JKN Israel. This entry was posted in JKN Alerts. Bookmark the permalink. Thank you! Our local supermarket carries a different brand under the Edah and we’d have not thought twice about buying it and doing the minimal checking on it. It’s nice to see that an impartial, outside source has done such a thorough test. 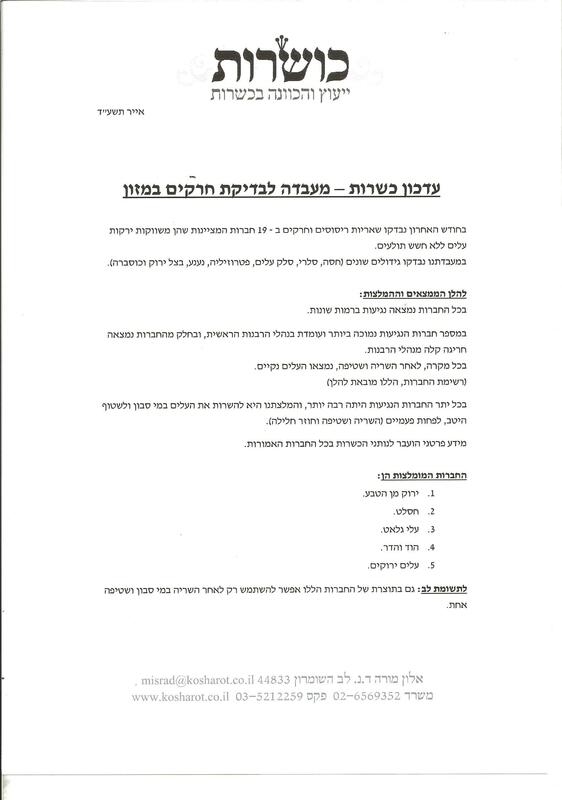 i called rav vaye once and he recommended chasalat (including for frozen- he didn’t recommend bodek- only eden and b’taam), though his name appears in conjunction with meshek cohen man and glatt alim (i think). anyhow, great that kosharot “recommends” soaking etc. the hashgacha itself takes no responsibility for the product without soaking and washing. also, which were the other 14 brands? how do i know that other brands with rav vaye’s seal on them were even tested? or whether a brand was excluded on the basis of infestation or pesticides? i don’t care about pesticides. So in conclusion, there is no point buying uber-kosher greens as they probably have bugs anyway and need pretty much the same washing as muddy normal stuff. Save money, improve quality of food and eat fewer pesticides by just buying normal lettuce and taking five more minutes to wash it properly.